What can we say about Australian wine & tradition? Quite a bit. First, Australians are funny. They are off-the-cuff, good sense of humor funny. Of the 12 representatives from the AFFW, not one was dry and boring. Second, they are all a bunch of dudes. Seriously, 12 men standing there talking about their wines. BUT, the majority of offspring from these 12 men are females. In fact, three of them have three daughters. As they talked about the next generation, they explained that many of their children left the “nest” to explore, but then returned to the family business with a deeper passion for it. So we expect these first families to stay family-oriented as it moves to those fourth, fifth and sixth generations. The most exiting thing I discovered at the tasting with this group on Monday, was the diversity of these wines and how well they can age! Sure, I knew Australia was diverse – I already drink a lot of Australian wine. But the ageing potential… from a 15 year old Marsanne to a 18 year old Cabernet to the most luscious “sticky” I’ve ever had, the wines here were tremendous. Both for sipping and storing in your cellar. Despite these families being the “first” and the “traditional” Australian wines, they are not opposed to change and innovation. In fact, they embrace marrying the old and new. Over the last century, wineries, like those part of the first families, have been experimenting with varietals and pruning and sorting and winemaking. They have worked hard to find out what works best. The future of Australian wine is certainly bright. 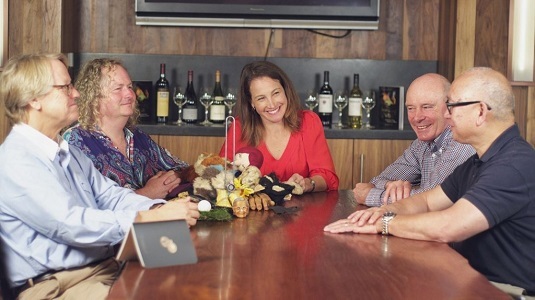 I had a chance to sit down with Alistair Purbrick of Tahbilk Winery, Robert Hill Smith of Yalumba Winery, and Chester Osborn of d’Arenberg Winery. All three believe this is a perfect time for Australian wine. The cheap Australian wine craze has died down, and it is time to re-introduce the world to Australian wine from those who do it best. Whether you love jammy Shiraz, bone-dry Riesling, cool-climate Pinot Noir, aged Semillon or some creamy Chardonnay, Australia’s diverse climate and wine selection can satisfy nearly any palate. Previous PostThere has never been a better time for rosésNext PostHurray for #Chardonnay Day!